High resolution image of a colchicine-treated cell, used in an attempt to disrupt its microtubules. We found that microtubules already formed are not disrupted in Paramecium multimicronucleatum. This open cytoproct shows the microfilaments around the retrieved membrane vesicles. 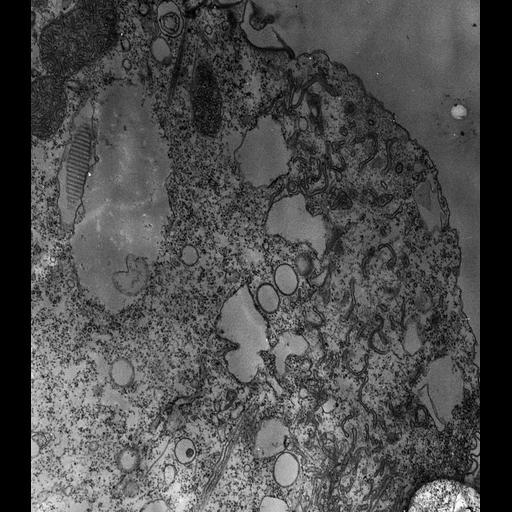 The larger vesicles appear to be expanded ER as ribosomes can be seen on their cytosolic face. A long membrane tubule appears to be bound to a microtubular ribbon that may have its origin at the cytopharynx. TEM taken on 1/16/73 by R. Allen with Hitachi HU11A operating at 60kV. Neg. 8,100X.